My house is a ketchup free zone… This is for two reasons, firstly my girlfriend isn’t a ketchup fan, therefore, it would be on me to consume it all and no one wants to see me trying to eat a bowl of ketchup! Second, for most applications that require ketchup, my barbecue sauces have a very similar flavor profile. The problem with most big brand ketchup is that the amount of sugar and additives aren’t actually needed to recreate the flavors. The challenge here was I needed 3 tablespoons of ketchup to complete the full barbecue sauce recipe. So in order to create one sauce I had to create two sauces. 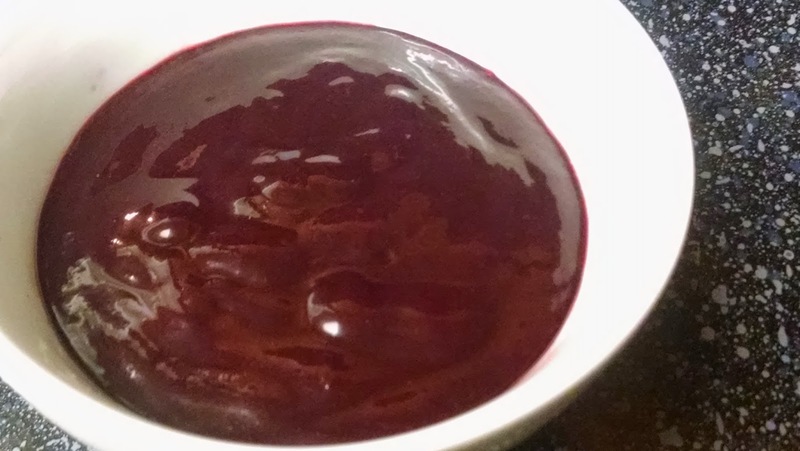 The mission, if I chose to accept, was to create a blueberry barbecue sauce. This resulted in my to find 3 tablespoons of ketchup. I won’t get into all the details, but lets just say I did try to calculate how many single ketchup packets I would need in order to reach my goal. However, one thing was clear, I could make this better at home any day of the week. 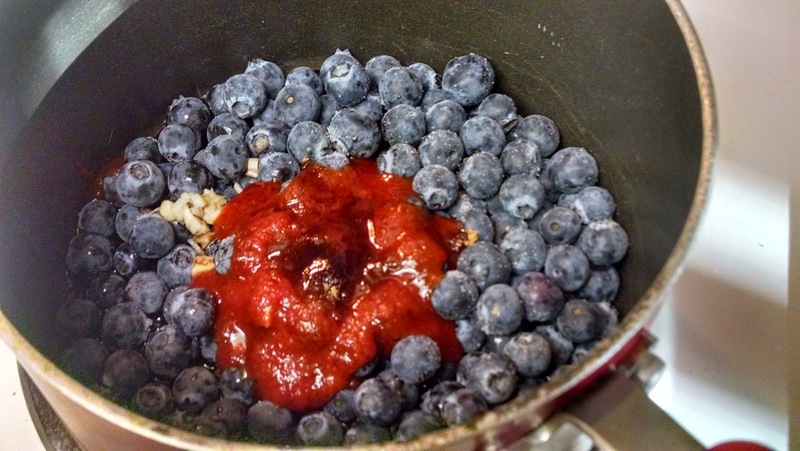 I had been trying to figure out how to adapt fruit into a barbecue sauce now that it is in season again. So the hunt begin! I found a recipe that I have made some adjustments to in order to help really deliver bold flavors. Let’s take a look at the recipe, shall we? *Please Note: My changes can be found in italics, but I have left the original recipe intact. Place all ingredients in a saucepan and bring to a boil. Reduce heat, and simmer for 15 minutes or until slightly thick. Remove from heat and cool. Place blueberry mixture in a blender, processing the ingredients until smooth. If the sauce isn’t thick enough you can return it to the pot and apply low heat as a measure to thicken sauce. Keep in mind, once the sauce cools it will thicken quickly. So, if you need to thin it out just add a couple tablespoons of water, and taste the sauce to make sure it hasn’t thinned out too much. Ready to look at some photos? Let’s go! All ingredients, please report to the saucepot. This is not a drill, I repeat, this is not a drill! Even though this doesn’t look like a lot of liquid, don’t worry, as soon as the blueberries begin to break down you will be surprised by how much liquid appears. After 15 minutes, a trip through a blender, and a quick dip into the saucepot again, this is your finished product. 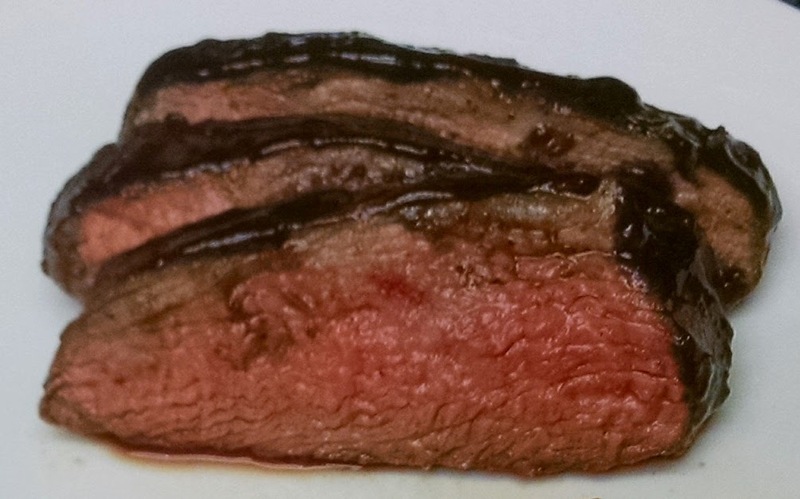 Here is one application with the barbecue sauce brushed on some tri tip. This is just one of many ways to use this barbecue sauce too. How else might you apply this luscious, rich, tangy sauce? Run out of mayo or regular, everyday barbecue sauce in the fridge? Throw some of this on your sandwich as your condiment instead. Well, truth is, you can apply this to pork, chicken or even fish. Yep, fish would work as well. I would recommend salmon or a very hearty, rich fish as the blueberry and balsamic will be a nice counterpoint. Like with the teriyaki, just brush some on and pop it the oven. About halfway through pull the fish out and brush a little more on the fish. Or, leave some on the side when you serve this fish with a nice wedge of lemon. If you really want to apply a fun twist, brush some of this on some vegetables to roast in the oven or grill. You could use carrots, zucchini, mushroom, broccoli, and cauliflower as well. So, once again, this sauce can be use in just about any application.